The mystery genre is one of predictable formulas. Enter the carefully long drawn-out plotline, the detective, the damsel-in-distress. Now consider these forms and cast them all aside. This is the realm you enter when you pick up Tiny Crimes. In a genre as old and frustrated as the mystery in today’s world, the authors of Tiny Crimes unearthed a refreshing way to turn these classic patterns on their heads: make them flash. 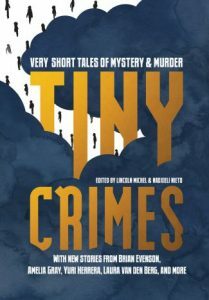 Told in only a few hundred words each, Tiny Crimes presents its readers with forty short stories of murder, mystery, and mayhem all quick enough to read over the morning coffee or between commercial breaks of your favorite crime drama. From fantasies of robberies at the office place to conversations over the phone, strange meetings in the park to psychological experiments, these stories draw from all spheres of crime and villainy to question what our darkest fantasies have to tell us about our lives and culture today. Beginning with the delightful repetition and mirroring of J. Robert Lennon’s “Circuit City,” Tiny Crimes kicks off with a fever pace as nothing appears quite as it seems. “Because we didn’t like John, our manager, and because we suspected that he planned to rob Circuit City on its final day of operations, we decided (John, John, and I) to rob Circuit City on its final day of operations.” From the humorous to the surprising, Lennon, and Tiny Crimes as a whole leaves no stone unturned; whether that be a workplace filled with Johns or a double cross turned triple cross and on. That is not to say that Tiny Crimes doesn’t know when to be serious. Take for example the poetic imagery and longing to reconcile memory that Ryan Bloom supplies in “The Hall at the End of the Hall.” Here memory and dream warps as the story begins, “The hall in my dream is narrow, the ceiling so high it’s out of sight, as if, maybe, it’s not even there, the hall not a hall at all but a walled walkway winding toward the sky.” These delicate images nestle frightful memories and painful regrets in their folds, inviting all of us in to part the curtains to the past. English works aren’t the only stories that populate this book though. Included in their original text and translation are four stories from across the globe featuring flights by train, limbo-worthy settings, questionable dates, and secret gestures and signs. These stories remind us that the nature of crime and villainy is not confined to one time or place but connected the world over as they brush shoulders with devious doctors, gambling schemes, the rhetoric of speech, frightening secrets held by those closest to us, and silent gangs of almost mythic tradition. With stories of playful wit alongside solemn imaginings Tiny Crimes offers a space for every reader in its observations of the human nature of crime as well as its questions of the truth behind the narratives we tell. Sometimes our heroes are really the villains and sometimes they are victims beside us. With each new story and author, readers are offered a new twist, a new take on the familiar and the strange. Masks change from delight to unease to sorrow and back again as each new voice has a story to tell. For those who are tired of the worn paths that mysteries have trod before or those looking for something new, Tiny Crimes offers itself as a refreshing breath of new life into the dark alleys and backroom dealings of old. As editors Lincoln Michel and Nadxieli Nieto say, “Crime is the borderland of culture, but a border that is forever changing.” To understand ourselves, stories of mystery and crime offer us a mirrored landscape like Alice’s Looking Glass where things may not be exactly as they seem or may appear all the more familiar for their strangeness. Rarely is the world as simple as black and white, hero and villain, predator and victim. Sometimes the characters we cheer on may be the villains themselves. Sometimes we may all just be the bystanders left to make sense of what clues are left behind. The state of villainy today is no clearer than it was yesterday and no more concrete than it will be tomorrow. In this gap, Tiny Crimes offers its own scattering of stepping stones and questions, but what is truly criminal is left up to the readers to decide.